Here are some facts about the Pompidou Centre. The Pompidou Centre, also known as Centre Georges Pompidou, is an art gallery and library located in the centre of Paris, France. It was designed by architects Renzo Piano and Richard Rogers. The building was opened in 1977, and was named after the French President, Georges Pompidou. It has about 100,000 square yards of floor space on 7 levels and is about 140 feet high. The centre has about 200,000 square feet of gallery space. It contains over 65,000 pieces of art, by over 5,000 artists representing over 100 countries. 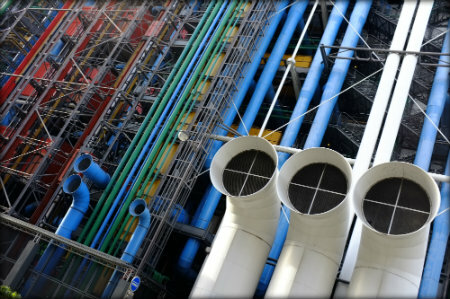 The Pompidou Centre houses Europe’s largest art museum, a large public library, a musical research centre. Since opening, over 180 million people have visited it the building. One of the unusual and sometimes controversial features of the building is that all the plumbing, the electrical and air circulation wires and pipes and even the escalators are on the outside of the building. Although it has won architectural awards, not everybody likes the building. It has been described by its critics as a ‘monstrosity’, an ‘oil refinery in the middle of the city’ and a ‘gerbil cage’. The museum has exhibited works by such famous artists as Pablo Picasso, Henri Matisse and Salvador Dali and hosts special temporary exhibitions every year. The museum also houses a restaurant, cinema and children’s play area. The Pompidou Centre’s public library has a collection of almost 500,000 books and can easily accommodate 2,000 readers. Television shows from around the world can also be watched in the library. The square in front of the Pompidou Centre contains the first modern fountain in Paris, with several sculptures. The square is also a popular place for mimes, musicians and other street performers. The Pompidou Centre has even featured in a James Bond film. In the 1979 film Moonraker it can be seen as an office used by the film’s Bond girl.